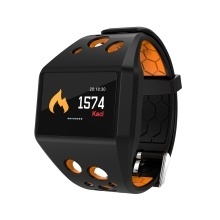 Healthy tracker, check your physical index, steps, distance, calories burned, speed and multi training modes will help you get a better understanding of your fitness level. Automatically recognize your state and monitoring the whole sleep progress with analyzing the deep sleep and light sleep hours. IP 68 waterproof withstand light rain, sweat and pool, 0.96 inch TFT color screen. Support Android system 4.4 version or above, iOS system 8.0 version or above, BT with 4.0 version. Multi-Function: Pedometer, Sedentary remind, Sleep monitoring, Remote photos, Music playing, Alarm clock, multi-language, notification push, etc. 1. Please scan the QR code on the manual and download the APP.